To my recollection I previously reviewed two of their publications, The Arrival of Missives by Aliya Whiteley (which I really loved) and Déjà Vu by Ian Hocking (which I didn’t enjoy as much, though others did). I have a new novella by them on deck to review, and I’m really looking forward to this collection, which will feature a new story by Whiteley, as well as stories from many other notable SF authors. “Unsung Stories have gathered eleven leading science fiction writers who have looked ahead to 2084, as Orwell did in 1948, for a new anthology – writers such as David Hutchinson, Christopher Priest, Lavie Tidhar, James Smythe, Jeff Noon and Anne Charnock, who are already famous for their visions of the near future. As the events of 2017 reveal an ever more complex relationship between people and their governments, classic dystopian literature is proving its relevance once again. But as readers turn to classics, like Nineteen Eighty-Four, writers are also looking to our future, and what may lie there. Speaking about the anthology, George Sandison, Managing Editor at Unsung Stories, said, “We knew when we first started work on the anthology that the idea was timely, but the start of 2017 has really hammered home how important writing like this is. “Dystopian fiction gives us a space in which to explore today’s fears, and the nightmares of society. For many people the events of the last eighteen months have brought those dark futures much closer, so it’s inevitable that we turn to literature to help us understand why. Head over to the Kickstarter page now to help support this anthology and take advantage of backer rewards! Also be sure to share the news with your social networks. Newly graduated warrior-mages Toria Connor and Kane Nalamas find themselves the last remaining mages in the city when a mage school teacher mysteriously falls ill and dies. But taking over the school themselves isn’t in the cards. They’re set to become professional mercenaries-if they make it through the next 18 months as journeymen first. The debate over whether to hunt mutated monsters in the Wasteland or take posh bodyguard jobs is put on hold when a city elder hires them to solve the mystery of the disappearing mages. Toria and Kane’s quest brings them to the British colonial city of New Angouleme, where their initial investigation reveals that the problem is even greater than they feared. But when a friend is kidnapped, they’ll have to travel to the other side of the globe to save her, save themselves, and save magic itself. I previously read the first book, STEEL VICTORY, in Gribble’s Steel Empire series. It is a very entertaining urban fantasy / alternate history, and I recommend checking it out if you haven’t yet. Gribble’s characters stood out particularly strongly for me. So I’m eager to see what new directions they go in development. Bradley Sharp was born in 1977 in Oxfordshire, UK. From a young age he filled many sketch books, so it only made sense to study Graphic Communication at Nene University, where he received a BA Honors degree in 1997. But the real world called Sharp away from academics, so he traveled around the globe a couple of times, working as a graphic designer. Now he makes a living by designing magazine spreads, but freelances with vector illustrations, allowing him to create something far-removed from what he does in his nine-to-five job. Sharp finds vector to be an easy tool and believes anyone can use it. “I’d say my artwork is nothing more than glorified doodling. I like the logical inconsistencies of surrealism and find inspiration from many places such as music or the science fiction genre. Dog Star’s novels lend themselves well to my style. I look forward to working with DSB in the future, and hope fans will like the imagery as much as they enjoy the words.” Find Sharp’s work online at his website. By day, J. L. Gribble is a professional medical editor. By night, she does freelance fiction editing in all genres, along with reading, playing video games, and occasionally even writing. She is currently working on the Steel Empires series for Dog Star Books, the science-fiction/adventure imprint of Raw Dog Screaming Press. Previously, she was an editor for the Far Worlds anthology. Gribble studied English at St. Mary’s College of Maryland. She received her Master’s degree in Writing Popular Fiction from Seton Hill University in Greensburg, Pennsylvania, where her debut novel Steel Victory was her thesis for the program. She lives in Ellicott City, Maryland, with her husband and three vocal Siamese cats. Find her online on her website, Facebook , on Twitter, and on Instagram. The kind folks at Ace/Roc books sure are kind to their street team. 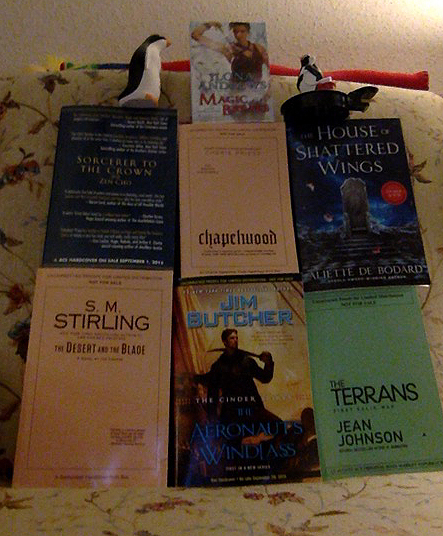 I had a flurry of books arrive the other day, including a bunch of microbiology titles and this wonderful pack of SFF. Look for reviews on many of these as their publication dates come. I’m pleased to take part in the cover reveal for this gorgeous upcoming Raw Dog Screaming Press poetry collection by B.E. Burkhead. Look for it in July. Artist Steven Archer has created a raw, textured cover to match B.E. Burkhead’s gritty, and unapologetic realism. In this poetry collection Burkhead shows readers what happens when they take off their rose-colored glasses and look at the world around them. Instead of fields of freshly grown flowers, he writes of alleys with broken bottles and hypodermic needles, no happily-ever-afters, just blunt and honest truths, sometimes with endings, sometimes without. Just as life doesn’t hand out answers, Burkhead doesn’t sugarcoat its truths. You can pre-order this collection now! Steven Archer is an artist and musician living in Baltimore, MD. When not recording, DJing, or producing art, he and his wife, author Donna Lynch, tour with their dark electronic rock band Ego Likeness. He has a BFA from the Corcoran School of Art in Washington DC and has shown his work at galleries and other venues throughout the east coast. His work has also been shown internationally in the form of album art and magazine illustrations. He is the author and illustrator of the children’s book Luna Maris. For more information about Ego Likeness, please visitwww.egolikeness.com. Steven’s solo electronic project can be found at www.hopefulmachines.net. Born dead to a barren woman, B. E. Burkhead is a poet, writer and artist. He lives on the vestigial tail of Maryland with his wife, son and an army of starving cats. 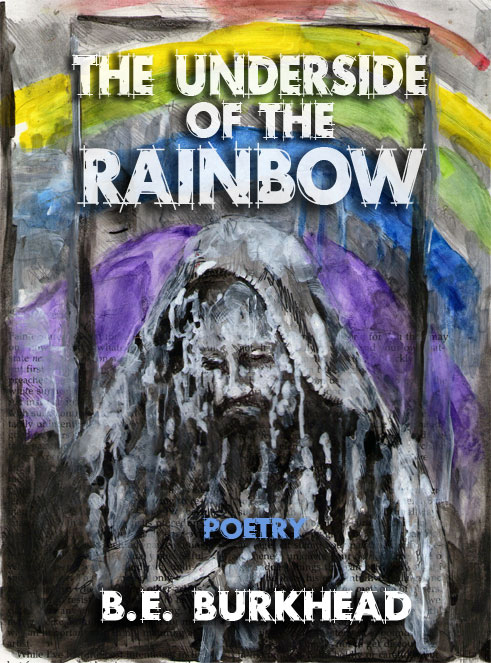 The Underside of the Rainbow is his first book of collected poetry. I wanted to let readers know about this beautifully illustrated children’s book that is having its debut as an eBook today, and is on special FREE download offer for this week! This and a newer volume are in my pile for a future posting on Small Things Considered, but I was able to get the electronic version to preview in the meantime to check out before letting you know about it. If you don’t know about the bacteria species Vibrio fischeri and its symbiotic relationship with the Hawaiian bobtailed squid, then this is a perfect introduction to the fascinating pair – whether you are a child or not. It is told in two parts, first from the perspective of the bacteria and then the point of view of the squid in a way that explains how the two species are mutually beneficial in their pairing. A science section that follows the story goes into greater detail of the microbiology. I’ll write up some more on this in the future along with the authors/illustrator’s new book Zobi and the Zoox, on coral symbiosis. 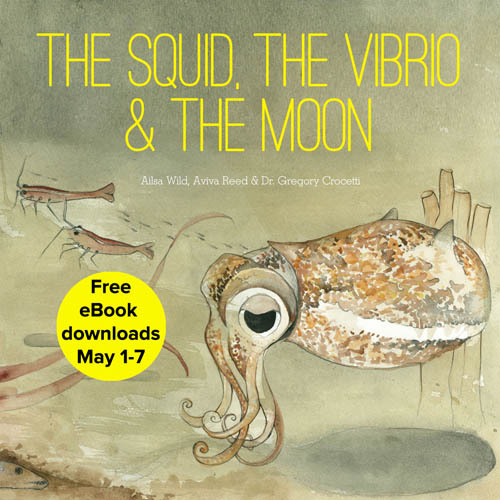 For the promotional period this week of 1st – 7th May 2015 follow this link to get your FREE copy of The Squid, the Vibrio, and the Moon, in iBook or GooglePlay format, or (if like me you prefer the physical beast) order a printed copy. I was fortunate to be chosen to be a member of the Ace/Roc Star Street Team. What this means is that I’ll be getting copies of recent and upcoming titles from Ace Books and Roc Books, who are part of the Penguin Publishing group. Aside from reviews, there may also be some goodies and potential giveaways for followers of Reading 1000 Lives. So keep your eyes open for future news. I appreciate this opportunity because I haven’t read much from their catalogs in the past, and have been uncertain of where to start off, particularly with so many giant series. So I hope readers of this site will appreciate my point of view as someone who isn’t already a fan of a successful author or who can honestly say how well a novel may work on its own. And of course this gives me the chance to jump right into debut authors or new series and get the word out, whether my reaction is positive or negative. If you have a favorite author from Ace/Roc I’d love to hear about it, or a title you are looking forward to. I won’t be able to read all they send, so your thoughts could help with decisions. 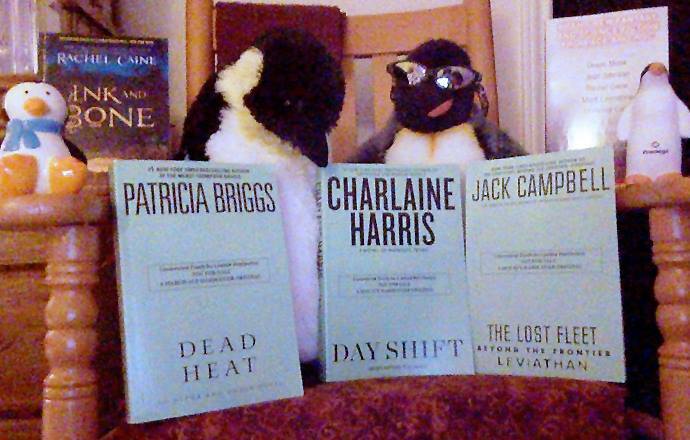 I’ve just started Day Shift, by Charlaine Harris, so look for a review of that soon. Speaking of, Harris is going on tour for the novel’s release, so check out her full schedule below to see if she’ll be in a city near you!